Which API to connect to? We no longer have to wander from one website to another to pick a restaurant and reserve a table. We simply go to a restaurant aggregator website and are introduced to a number of places to choose from. Thanks to APIs, all the necessary info is collected in one place. For greater clarity, watch our video that explains in simple terms the function of APIs in hotel booking. 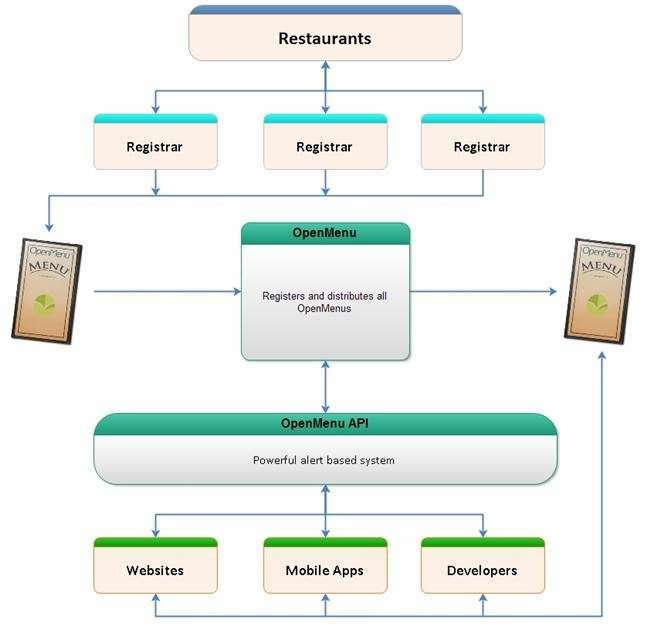 In this article, we’ll describe the main API providers in the restaurant industry. They integrate table bookings and provide restaurant data for travel and hospitality businesses. Table reservation systems (TRSs). This restaurant management software makes the jobs of restaurateurs, administrators, and waiters easier by consolidating all activities into one user-friendly dashboard. 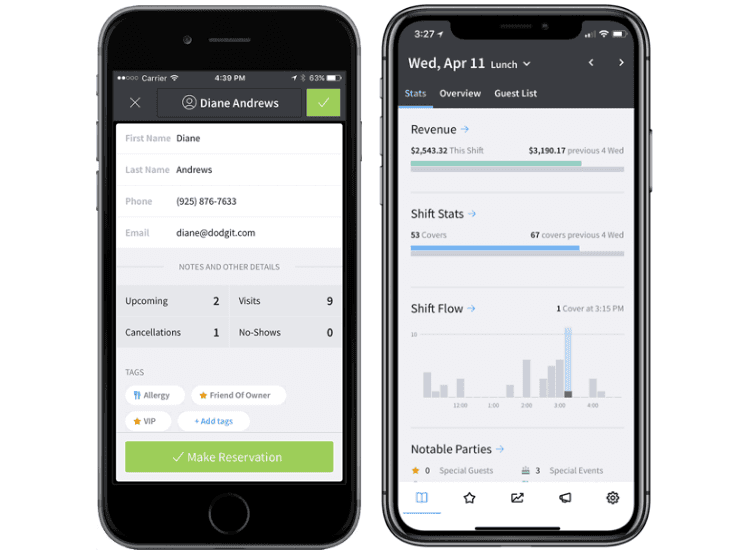 Among the basic functions is gathering bookings from phone, email, and aggregators, table seating options with custom plans, connected mobile apps for enterprise mobility, along with guest surveys, discounts for regular clients, and more. Booking aggregators. Sites like OpenTable and Yelp, which we’ll talk about later, connect with TRSs via API to provide info about tables that have been booked via their platform. These platforms also use APIs from review websites to collect comments, photos, and tips for a restaurant posted there, or integrate with Google Maps to show visitors get around options. Point of sale systems. Combining software and hardware, these transaction management systems allow customers to pay via terminals, touch screens, and other options. Modern POS systems for restaurants combine functionality for inventory management, labor management, reporting, and loyalty programs. POS software connects with aggregators via API so that back at the restaurant they’re informed about the food that was ordered and the payment made. External dining-related platforms. In this article, we identify the following elements of the dining experience: location discovery, ordering and delivery, menu standardization and sharing, and restaurant rating. These websites, apps, and services provide their own information useful for guests and other industry players: Review and menu platforms send their data via API to reservation websites, while delivery apps are integrated with POS systems, etc. The more sources interconnected via APIs, the more data provided to end-users in a single environment. Being such a big connectivity hub between visitors and restaurateurs, reservation platforms are more than just websites – they’re software providers often offering table reservation systems, APIs, widgets, or white label solutions for a restaurant’s online presence. Their functions are as simple as putting more diners in seats, and as complex as using machine learning to optimize every moment of service. Let’s examine the three leading restaurant reservation systems: OpenTable, Yelp Reservations, and ResyOS. An undisputed leader in online restaurant booking, OpenTable owns 38 percent of the entire reservation software market. Operating since 1998, the platform is a familiar presence in the restaurant scene. OpenTable is well-suited for restaurants that visitors tend to book tables online. However, if most of the profit comes from walk-ins, to-go, or delivery, then your first-choice partner isn’t OpenTable. Why? Because unlike its competitors, OpenTable doesn’t have a fixed price, and its pay-for-performance fee can be quite pricey – $1 for each seated guest booked via their website. Table management system. Among OpenTable’s pros is a simple-to-use table management system with guest recognition and email marketing. The OpenTable app for works remotely and can update via a smartphone. The platform helps fill empty tables and contributes to steady business flow by drawing attention to tables that are open on the consumer app. APIs. OpenTable links to each individual restaurant and retrieves its data via Directory API. It synchronizes data for restaurants visible as search results on the OpenTable website. The platform doesn’t offer an open API, so if you want to enjoy its benefits, apply for the affiliate program. However, since not every applicant gets approved, there’s another option – the unofficial API for accessing OpenTable restaurant data and URLs where reservations can be made. Additionally, you can use a widget to add the OpenTable reservation form to your website. Yelp boasts $173 million monthly in active owners. These people heavily rely on its ratings, reviews, and accurate data to make decisions. And finding a place to eat is one of them. That’s why many businesses want to be listed on the website and also integrate its extensive database of reviews into their products. Table management system. Yelp’s Table Management App is already interconnected with its online booking platform to seamlessly manage reservations from there. Among other features are SMS communication with clients, waitlist management, and a Guestbook to leave suggestions and preferences of returning diners. APIs. Yelp’s API offerings are very rich: Yelp Fusion API, GraphQL API, and Yelp platform with Data Ingestion and Checkout APIs. Yelp Checkout API for integrating ordering, scheduling, payment, fulfillment, and customer support processes into the transaction flow. Yelp Reserve Now button to link customers directly to your Yelp Reservations page. Yelp Reservations calendar widget to allow searching for reservations from your website. Initially started as premium reservations, now the Resy platform connects 10,000 network restaurants globally and covers 160 cities. Table management system. 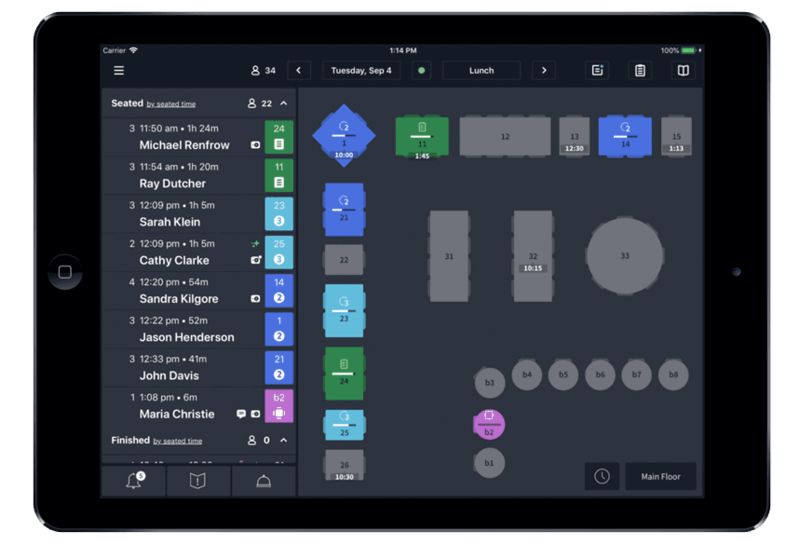 Resy OS offers a floor plan with table and customer management that synchronizes with a booking widget at the restaurant’s site. Resy’s built-in two-way texting with guests enables direct relationships between consumers and restaurants. The platform tracks small but important events like wine ordering and table greetings. Resy allows restaurants to allocate reservations to different subsets of their customer base. This way, to maximize profit, restaurants can offer more reservations to guests who come through a certain channel, if they appear to be the biggest spenders. APIs. The Resy API displays available reservations depending on search criteria, providing the list of all user reservations, offering details on any chosen venue, and integrating the list of top venues picked by the Resy team. The API returns the information on restaurant location, number of free seats, price ranges, platform-specific tags (such as “Yummy food!” or “Vegan Joint”), rating from Foursquare and Google, and contact info. 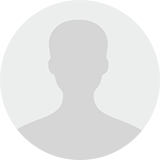 To obtain an API key for Resy, contact developers with the name of your application at this page. If you’re planning to purchase the table management platform, API integration is included in the full stack plan. Other reservation systems, although global and convenient to use as well, don’t provide APIs for integration. Meanwhile, they can be of use to the restaurants that need reservation platforms for online booking or want to attract new customers to their business while being posted on a popular restaurant aggregator website. BookaTable. While OpenTable rules the US market, Bookatable is the European leader in online restaurant reservations with 10.7 percent market share. Bookatable doesn’t publicly reveal their pricing model. Each quote is based on a restaurant’s situation. 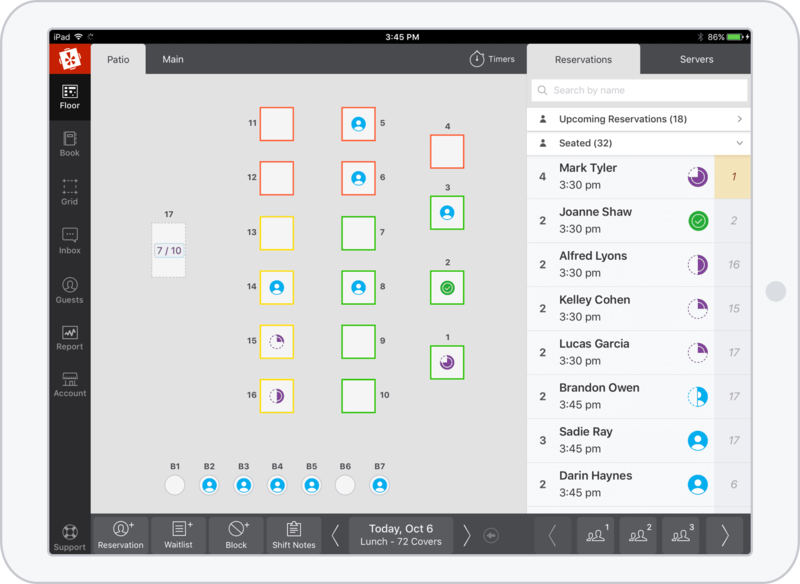 Bookatable’s management software stands out for its additional services and tools, customizable booking calendar, and an automatic waitlist that fills tables in case of a last-minute cancellation. Eveve. Established in the UK, Eveve’s largest market is now in the US, where they manage restaurant reservations across 27 states. Eveve manages online reservations, telephone bookings, and walk-ins on the same system. Its special feature is an auto-constructed customer database based on the day-to-day reservation activities, giving owners insight into their respective demographics. Also, Eveve provides an electronic point of sale (EPOS) system. Bookenda. One of the leading online booking applications for restaurants, spas, bars, and other professional services in Canada, Bookenda is now expanding to the US and Europe. Their reservation solution optimizes turnaround time by allowing the limiting of the number of reservations or setting different service lengths for certain days. The Bookenda reservation widget can be added to your website or social media pages. When looking for a place to chow down, two things can make choosing easier – location and rating. Using APIs, we can now build location-aware applications complemented by user reviews with minimal effort. So, having everything they need to know about the restaurant in one place, your visitors will go to your platform to make a reservation. The key location and rating players include Google Places, Foursquare, Yelp, TripAdvisor, and Zomato with its Foodie Index. The API can be used for implementing a feature that allows users to find restaurants located around them via GPS. For that purpose, you’ll need to set a specific category search – restaurants – using request object as shown in the code below. adding photos, tips, and reviews posted on Foursquare by customers. Given user authorization, you can leverage the following information from each person’s Foursquare profile via the Places API: a list of restaurants a user has visited, places they’ve checked into, etc. 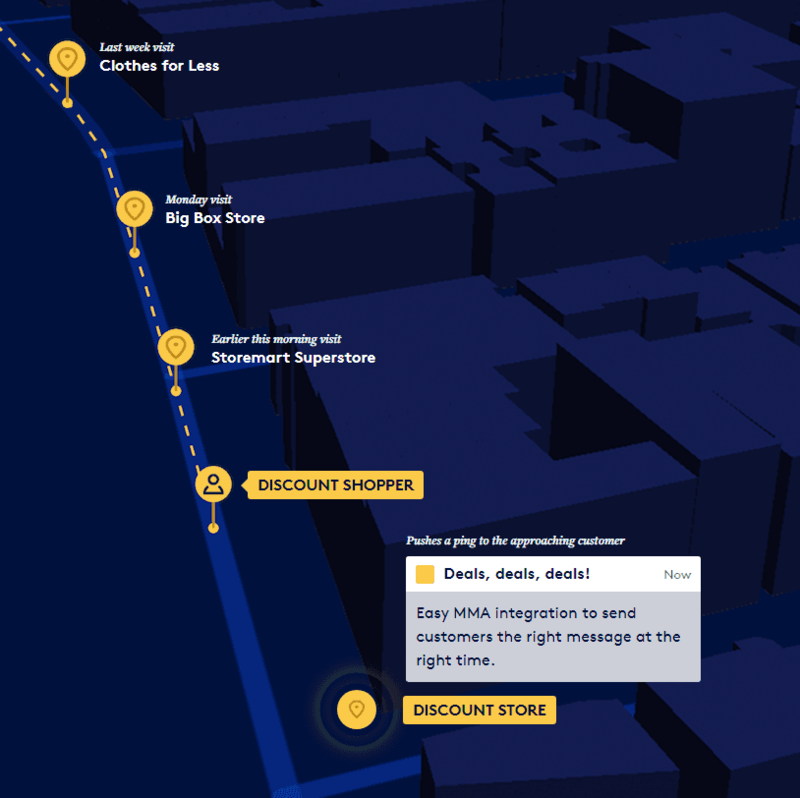 Pilgrim software development kit – a location-awareness engine that provides users with contextually-relevant, geo-aware content. Places Database – providing recognition of 105 million global places categorized and graded with the innovative ten-point rating scale and popularity scores. It’s done via Snap-to-Place technology that connects a physical location with meaningful venues. To get started, create a developer account on Foursquare. This will give you a client ID and client secret needed to use the API. detailed restaurant content – photos, price levels, hours of operation, and Yelp rating. It sorts reviews by recency, votes, users you follow, and other review quality factors. 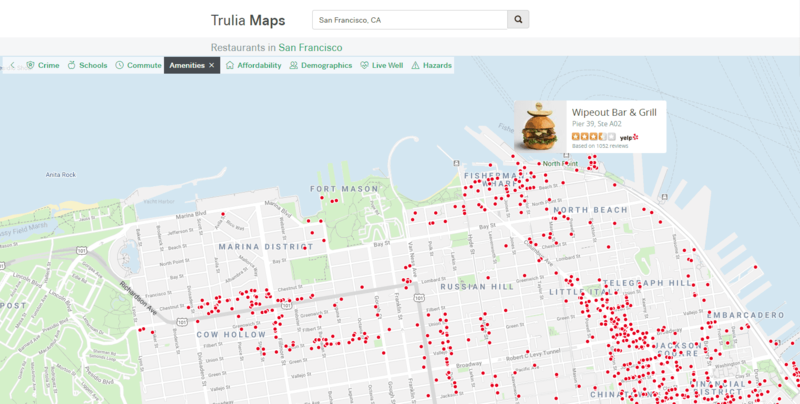 An example of how Yelp API integration can broaden a platform’s abilities is Trulia, a real estate website. Its maps can show consumers the cafes, coffee shops, or pubs in a neighborhood, which can factor into the home search process. Sometimes clearly defined endpoints of the regular API don’t match your needs. In this case, you can make modifications to them using Yelp’s GraphQL API. This API query language enables the customizing of requests to fit specific use cases. Then, if your use case doesn’t require all of the data, GraphQL speeds up your requests by doing less work on the server side to fulfill them. However, while still in the beta, GraphQL is limited to 10,000 queries per day. Restaurants are one of the three major place-of-interest (POI) types on TripAdvisor, within which three subcategories are defined: sit down, bakery, and fast food. subratings – measured against a number of subcategories: food, service, value, and atmosphere. popularity ranking – a popularity index ranking on TripAdvisor, which compares restaurants within the same destination based on their popularity. It’s measured by the quality, quantity, and recency of their review content on TripAdvisor. To get access to the TripAdvisor API, fill out the Request API Access form. Please note that the number of API keys is limited, and not granted for data analysis, academic research, or any use not associated with a consumer-facing (B2C) travel website or application. arrange restaurants in listings that cover various themes and occasions. Zomato Foodie Index API identifies the quality of restaurants in a particular area to help users compare locations, a great help for travelers while deciding where to stay. To calculate its Foodie Index, Zomato uses local restaurant information and user-generated content. This API can be a perfect complement to rental and travel platforms. As a matter of fact, real estate portal CommonFloor has already integrated the API into their Locality Map section to help users find neighborhoods that offer good food. Travel planning portal TripHobo also uses Zomato’s API to offer dining suggestions based on users’ itineraries. Restaurant Search widget searches for restaurants in a city. Nearby Restaurants widget displays the most popular restaurants around a specific location. Foodie Index widget scores restaurants. Restaurant Collections widget provides thematic lists of the best restaurants in the city. Online Ordering widget discloses restaurants accepting orders online. If you decide to facilitate the delivery experience, you’ll need to integrate ordering and delivery functions into your product. The following APIs can help you with that. British food delivery company Deliveroo operates in 12 markets: 8 in Europe and 4 further afield. Based on a predictive technology, Deliveroo evaluates the most efficient way of distributing orders depending on the location of restaurants, riders, and customers. Using machine learning, they predict the time it will take to prepare a meal. order details can report all orders on a certain date / at a certain time. So far, around 500 restaurants sites along with 25 POS companies have plugged into the API. Deliveroo claims that the API integration takes about two weeks. EatStreet is a US online food ordering service that facilitates delivery from about 15,000 restaurants. One of the largest public APIs for food ordering, the EatStreet API retrieves info and menu data for local restaurants as well as placing and tracking orders for takeout and delivery. The API can also be used to create and manage user accounts, credit cards, and addresses. provides order status: processing, awaiting preparation, preparing, preparing and delivering, out for delivery, ready for pickup, or delivered. EatStreet user API registers users in the EatStreet database, saves credit cards, addresses, and other preferences, and retrieves past orders for a user. Just Eat is an online ordering service operating in 13 countries. Its Partner Services option allows delivery companies and EPOS providers to integrate via API. PSA: If you’re wondering about connectivity to Uber Eats, there’s currently no API for the service. You can partner with Uber directly to organize the delivery via regular Uber services. Since the first point of contact for many potential customers happens online, restaurant menus have to be up to date all the time. By means of the APIs described in this section, restaurants can make changes and update their menus to multiple places across the web in one easy step. As a result, your platform always fills the bill for visitors with relevant info. This common menu platform stores restaurant menus in a freely accessible and searchable database (over 500K menus and over 24 million menu items). Having a standardized menus’ format, OpenMenu changes the way restaurants maintain and update their menus with one place to manage and edit that’s shared among other websites and apps. OpenMenu’s ingredient search engine provides detailed nutrient reports and nutrition labels. It gives access to over 200,000 ingredients and 3,000,000 nutrients, the source of calories, and a daily value calculator for an ingredient. 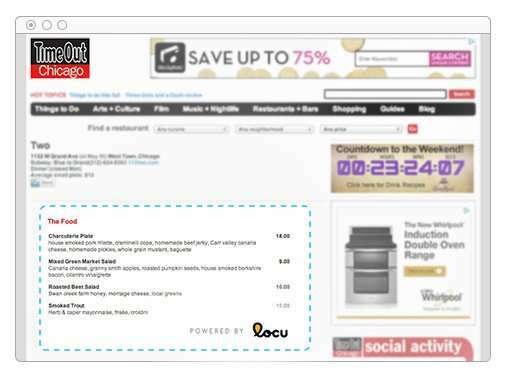 Locu is a menu publishing tool for creating, managing, and editing menus online for both print and digital formats. Any changes that a restaurateur makes to the menu from within the Locu platform are reflected on their own website, mobile app, and social media pages automatically. Locu doesn’t make automatic changes to owned venues as they are owner-controlled. What are the major components of the Locu API? 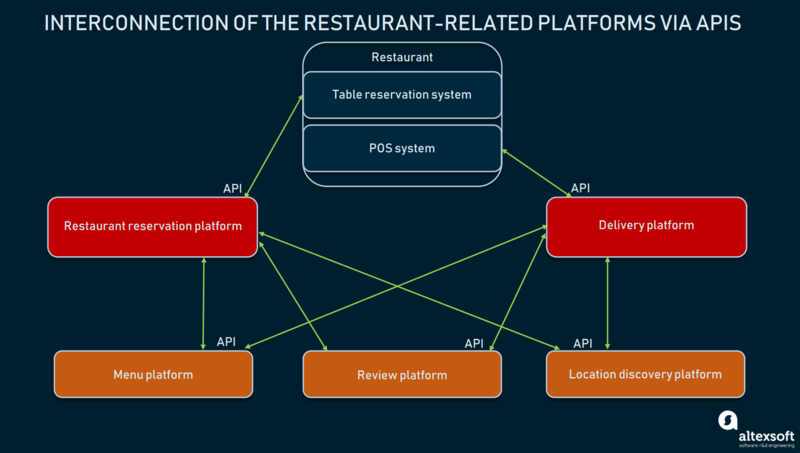 The matching API accesses and integrates the Locu structured dataset of restaurant information. extended info: a collection of facts about a restaurant like delivery hours and requirements, a brief history, wheelchair accessibility, payment methods, smoking permitted or not, etc. The menu on Locu.com has a list of sections and a corresponding list of subsections with menu items or text items nested inside them. The search is done by the name of the menu, its sections, subsections, and their content. It can provide a longer description of an item, its price, available options like “chicken or beef”. To insert Locu’s customizable price lists into arbitrary web pages, there’s a Locu menu widget. Choosing an API can be a great commitment depending on the scope of the system. It can involve large investments of both time and capital. Although we’ve covered a few different areas, you may still be left with a question, Which API is the best for my circumstances? In our related article on the travel APIs, we’ve already elaborated on how to choose an API for integration. Geography. Make sure that the data you connect to is relevant for your target area. Otherwise, you won’t find it useful. So, let’s say it’s a location discovery API. Check whether it finds your whereabouts. 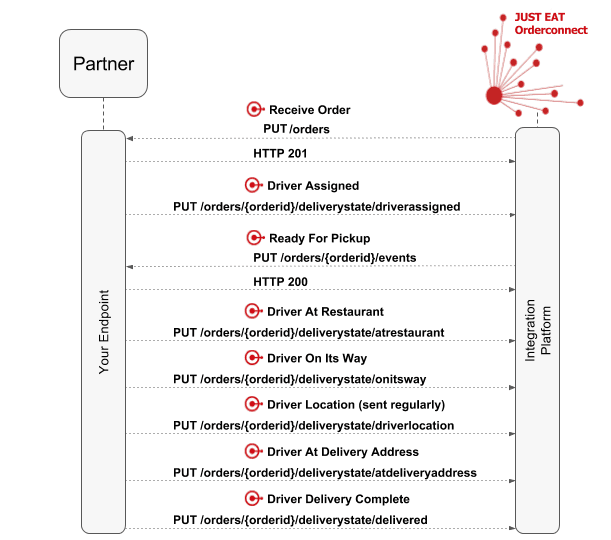 If it’s an order and delivery API, be sure it works for restaurants in your part of the world. The breadth of functions covered. Does this API do everything you need it to? Filter your selection based on the availability of features that are must-haves for you. Request limits. Managing the API’s limits can lead to complexities because we must know how to administer it in such a way that we do not exceed its limit. Otherwise, the system could expel you. Some companies limit calls in the middle of a very important action, due to its hosting performance limitations. In contrast, a good practice is to provide info on the number of calls left each time a call is made. This way, it’s much easier to create an efficient and reliable service using an API. Support and an active community. If things go wrong, you’ll need someone to address your questions to. So, it’s a big plus when the API providers offer support in forums and have an active community. Additionally, it’s better if the company actually uses the API itself in its own products. If they do, it’s more likely to be well supported and have lots of options. Secured authentication. Choose the API that allows for access only if it can authenticate from your end, rather than something open to everyone else. Business logic. An API whose names and methods conform to the conventions used in your platform will result in a smoother and more successful integration. API provider’s reputation. Remember that your name will appear among the API’s customers. Consequently, its reputation may have an either positive or negative effect on your business’s image. Really awesome article, I loved reading it. thanks for sharing.